Wie bringt man buddhistische Traditionen, westliche Prägungen und soziale Verpflichtungen unter einen Hut? Eine thailändische Hochzeit öffnete unserer Rednerin Rune aus Berlin die Augen! 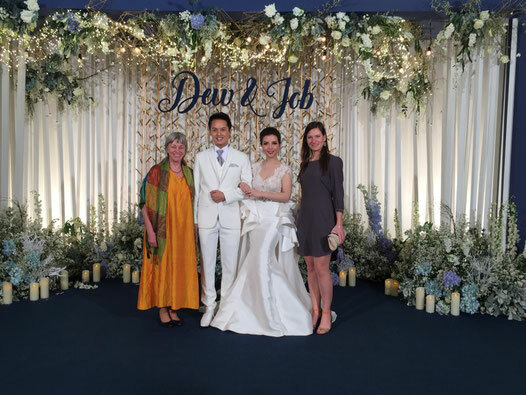 Was sie im Februar in Bangkok erlebte, übertraf selbst ihre kühnsten Vorstellungen von einer asiatischen High Society Hochzeitsfeier. 2002/2003 hatte Natthapong (Spitzname: Job) ein Austauschjahr in meiner Familie in Deutschland verbracht und danach engen Kontakt zu uns gehalten. Als wir 14 Jahre später seine Hochzeitseinladung bekamen, buchten meine Mutter und ich spontan Tickets. Am großen Tag sollte uns um 6 Uhr morgens ein Bus im Hotel in Bangkok abholen und zur Hochzeitslocation fahren. Mein Verdacht, mich bei der Uhrzeit verhört zu haben, bestätigte sich nicht. Um 7 Uhr in der Früh fanden wir uns im „Chrystal Design Center“ wieder. Nach einer scharfen, kräftigenden Suppe zum Frühstück zogen neun Mönche in orangen Kutten in den Saal ein. Die traditionelle buddhistische Zeremonie begann. Bis Mitternacht war nun Hochzeit non-stop angesagt. Von einer „Parade“ der Leute des Bräutigams und seiner Prüfung durch die Brautjungfern über die Verhandlung des Brautpreises. Aber es war noch nicht Schluss! Es ging weiter bis zu einem Dinner mit 700 Gästen, einer amerikanisch angehauchten freien Trauung und einer rauschenden Party fürs junge Volk war alles dabei! Glitzer und Glamour en masse!!! In den Tagen nach der Hochzeit verbrachte ich viel Zeit mit dem Brautpaar und ließ mir alles nochmal genau erklären. 700 guests – I had never been to such a big wedding before! Is that common in Thailand? More or less! (laughing) Both of us have lived abroad for several years, among other countries in the USA and Germany. These experiences have influenced us a lot in our way of perceiving marriage and relationship in general. We would rather have preferred a quite intimate wedding ceremony, with about 100 guests in the countryside, like the ones you hold with Strauß&Fliege in Germany. But that would not have worked out for our parents because for Thai society. A wedding with all its ceremonial parts is still a big thing and the bigger the wedding, the better for your social status. So, when you want your parents to be involved, there will be a minimum of 200 to 300 guests. This is according to the families’ financial possibilities, of course. In our case, each family came up with 200 guests they wanted to invite – most of them we don’t even know – and all in all we invited a total of 500 guests. In Thailand, people would just show up spontaneously and bring other people along. We were prepared for that and had ordered food and drinks for 600 people but in the end there were 700. 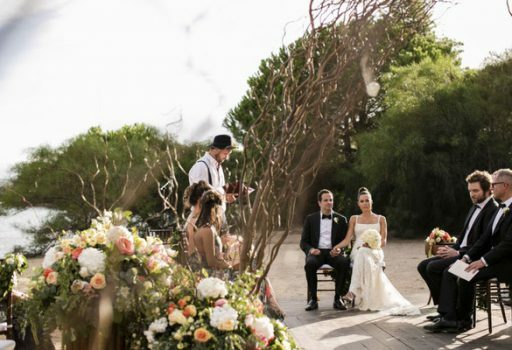 Your wedding was divided into several ceremonies and receptions. Can you explain them briefly? Although most Thai people are buddhist, not everybody includes a buddhist ceremony in their wedding. But as we both are very much into Buddhism and think that it’s a good blessing for us, we decided to have it. We had to do it right in the morning because the monks are not supposed to eat anything after Midday. So everything has to be done before that. What happened afterwards forms part of our Thai traditions, too. The parade of the groom’s people and the negotiation about the bride price with all the wishes and blessings from relatives and close friends afterwards. Later on, we held our evening wedding ceremony and had a reception with dinner for the 700 guests in a bigger hall. At 9:30 pm, our friends moved into another room where we had a great party. We had live rock and pop music with round about 200 people until Midnight. What happened during the morning part of your wedding – the buddhist ceremony, the parade and the negotiation? The buddhist ceremony included nine monks because the number 9 in Thai sounds exactly the same as the Thai word for „prosperity“. A lot of symbols, praying and singing are involved in this ceremony. The monks show their connection to Buddha. We as a couple show our respect for the monks and they give us their blessing in several ways. For example painting three white dots on our fronts or pouring blessed water over us. After lunch, the parade started. That’s a Thai tradition representing a fun part before the negotiation between the two families about the bride price starts. The groom’s best men, his parents and negotiators line up carrying gifts for the bride’s family. The parade moves towards the negotiating place. On his way, the groom has to pass various tests by the bride’s maids who want him to prove his love and suitability for marrying the girl who is one their best friends. Meanwhile the bride herself waits hidden in a separate room. It was very funny: Job had to sing, to dance and to shout out all the love he felt for Dew so loud that she should hear it in her room. Nowadays, the following negotiation is rather a show. The bride price is still being paid but the families agree on it beforehands and some families decide to give the money to the couple later on, This can count as a financial basis for their married life. As you can imagine, it can cause quite some trouble between bride and groom if her family decides to keep the money! But some time ago, it could happen that no agreement was found and then the wedding would be cancelled right there. When the agreement was announced, Job was allowed to call for Dew and walk her into the room! That was the time for changing rings. What followed then, was the part that touched us most deeply. We showed our respect for our parents, close relatives and families’ friends. We offered them a gift and they expressed their wishes for us and gave us a gift back. This was followed by a ritual when they poured blessed water over our hands and gave us advice. That can only be done by people who are older than the bride and the groom. This is because we believe that they have gone through life already and are able to give helpful advice. That meant a lot to us. This morning ceremony was of spiritual importance for you and it took you half a day already. Despite that, why did you still decide to hold an additional, independent wedding ceremony at the evening reception? Job: Opposed to morning ceremony that is limited to a small circle of close friends and relatives. the evening ceremony was extended to a wider group of guests. In the past this served as an announcement to other people that we got married. For this, typically, the majority of guests would be coming from our parents side. You don’t necessery need to host it on the same day. This can be very tiring for both, the bride and groom. But most people would still go for it as it is cheaper to rent the same venue for the whole day. 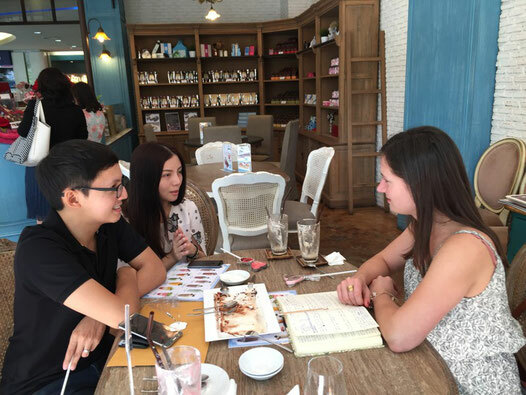 For our case, there were many relatives who had come to Bangkok from the countryside as well as our overseas guest, so it was better to keep it within one day. Dew: We wanted to have a very personal and emotional part in our wedding day at a point where everybody was present. My mother is Buddhist, but my father is Catholic. I am the eldest daughter and it was hard for him to let me go anyways. He even refused his admission when Job first proposed to me! I had to make use of all my marketing skills in the following months to finally convince my parents that Job was a responsible, intelligent and successful man and the right one for me! After all that, I knew that it would mean a lot to my father to walk me down the aisle during the evening wedding ceremony. He knows that ceremonial part from Church. Consequently and we did that also in his honor. 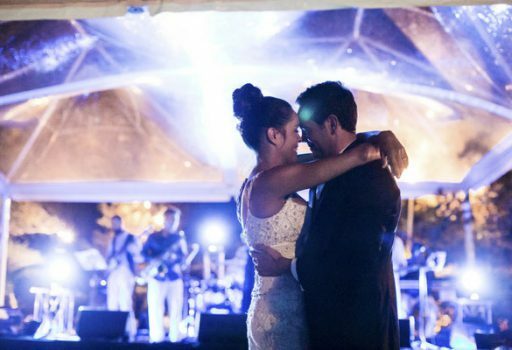 Could you tell us something about your independent wedding ceremony in the evening? Dew: Two friends of mine were masters of ceremony and moderated this part. First of all, my bride maids entered the hall. Then my father walked me down the aisle they were forming. At this receptional part of a Thai wedding, it is well-seen that someone with a good reputation in society holds a speech. In our case it was the Minister of Labour because he is a friend of Job’s father. Afterwards, our MCs interviewed us about how we got to know each other and so on, my maid of honour and Job’s best man held speeches. We symbolically cut the wedding cake with a sword! But the cake was just fake, you couldn’t eat it any part of it. And Job had prepared a very special surprise for me. He sang one of my favourite songs but usually he wouldn’t sing at all… That was very emotional. When did you start planning your wedding and how many people were involved in that? 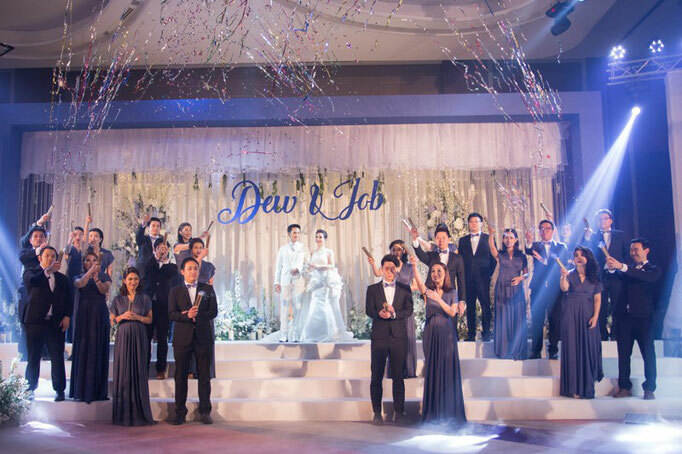 Dew: We started one year ago with a wedding planner team including 10 people. They were really important, also at our actual wedding day. One was there all the time as some kind of personal assistant for me. She straighten my dress for the pictures. For example during this large photo session at the afternoon reception when we were taking pictures with every guest arriving for almost three hours in a row. 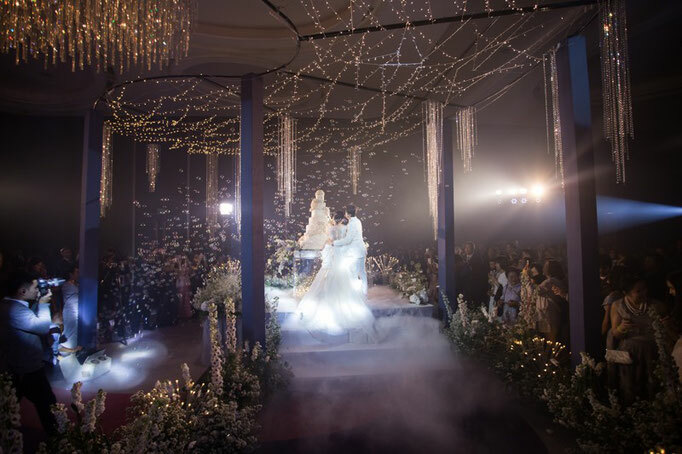 Then we had 30 people for the decoration that included a lot of flowers and a ceiling filled with small lights and chrystals in order to look like a sky filled with sparkling stars. This was because my mother likes flowers so much and I like stars so much. In the evening, there were 30 waiters to serve our guests and 10 photographers and filmers who accompanied us during the whole day. 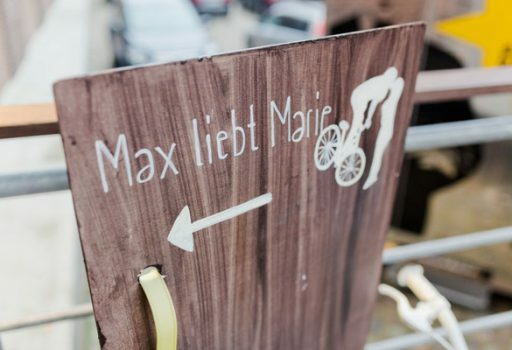 Strauß & Fliege war auf DER Hochzeitsmesse in Hamburg: Max liebt Marie!